On April 5, 3Points Communications marked our seventh anniversary in business. We’re proud of what we’ve accomplished in that time, so to celebrate we took off from work a little bit early on that Friday and gathered with clients, family, and friends for a tour and tasting at KOVAL Distillery. KOVAL is a great Chicago success story. Established in 2008, KOVAL was the first distillery in Chicago since the mid-1800s, and their enduring commitment to producing unique spirits of the highest quality has led them to numerous awards and growing admiration. In order to stay crafty ourselves, we make it a practice to visit places where products and services are created by craftswomen and men. That’s how we stay inspired and informed, and that’s why KOVAL was a natural choice for our anniversary party. As the team and our guests sampled their products and learned more about the company, I was taken by the similarity between 3Points’ and KOVAL’s guiding principles and practices. First and foremost, passion is at the heart of we do, and this is true of KOVAL as well. As our guide, Katie, led us through the tour and tasting, her love for her job, admiration for the founders of the company, and appreciation for the art of producing outstanding spirits were evident. It was easy to believe in the KOVAL promise after learning how they approach different aspects of their business. Their success starts with passion, and we take that same approach at 3Points. Simply put, we love what we do and that passion is reflected in most everything, from interacting with our clients, to consuming media, to creating engaging content, and finding ways to help our clients achieve a higher level of credibility and visibility. Another important aspect is an uncompromising commitment to high standards. With KOVAL, that shows up in their reliance on regionally-sourced ingredients, production that meets Kosher standards, and using only the “heart cut” from the distilling process in their spirits. By setting and maintaining high standards, KOVAL is able to distinguish themselves from the pack, and that’s a spirit [pun certainly intended] that we try to emulate at 3Points. Experience has taught us that it can be easy to go for the quick public relations and communications solution, but there can be a price to pay for that decision down the road. By maintaining the highest of standards and aiming for the highest impact rather than the quick-and-easy solution, we find that the long-term results are both more sustainable and produce better outcomes. Finally, there is the spirit of innovation. KOVAL has consistently produced unique products that are unlike anything else on the market, and they are constantly innovating by trying out new variations that meet (and sometimes create) the demand from their consumers. For example, their award-winning gin adds angelica root, coriander, and rose hips along with the standard juniper as botanicals. In the “me-too” corporate world of making the safe choice, it is essential to continually learn and change. In terms of standards for both their products and themselves, KOVAL has built a flourishing and internationally-recognized business. While we work in a business where deadlines can be tight and news and narratives are dynamic, a commitment to high standards means we don’t get rattled by external factors in order to maintain momentum. The high standard means we do not simply go through the PR motions, but we’re constantly generating new ideas as well. From a creating a unique blog series with Chicago trading legends to co-founding a city-wide table tennis tournament for technologists, we thrive off the ability to think outside of the box for both clients and ourselves. These ideas can be higher risk, but as a small business you can’t be afraid of failing. 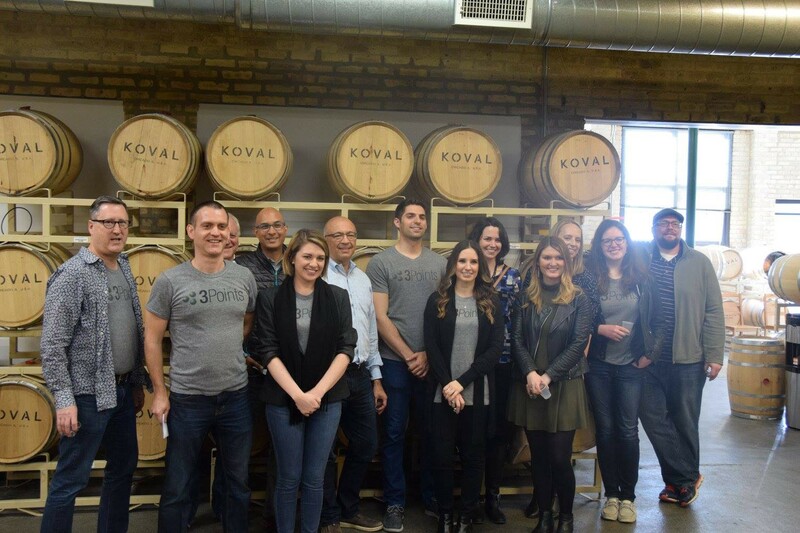 At the end of the day, a field trip to KOVAL was more than a nice way to spend a beautiful spring afternoon; it was a living example that you can grow and prosper without sacrificing quality, passion or your ability to innovate. Here at 3Points, there have been many times when circumstances could have led us to sacrifice our ideals, but we stuck to our guns and wound up producing better outcomes in the long run. What has been your experience in situations like this? How have you been able to maintain growth while faced with the challenge of keeping to your ideals? And where are the crafty places you like to go? We’d love to hear your feedback.